Description: Great starter home! This cozy 3-bedroom, 2-bath ranch sits on a quiet cul-de-sac street and backs to mature woods. Watch the world go by from your expansive covered front porch, or enjoy the view of your tree-lined, fenced backyard from the rear deck. Every comfort at an affordable price – including a fully-equipped kitchen with dishwasher, microwave range/oven, refrigerator, custom cabinets & a walk-in pantry; family room; master suite with double vanity in the bath; cathedral ceiling & ceiling fan; laminate & carpeted floors; central air; full basement; even a handy storage shed. 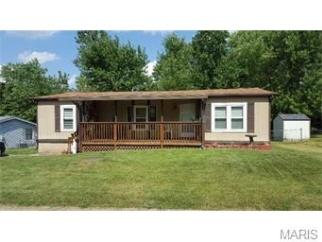 Convenient location with direct access to gravois/hwy. 30.